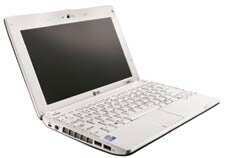 One of the most common trends this year has been the rapid proliferation of netbooks. These mini-notes, with their smaller screens and lower power requirements, have gained popularity due to their immense portability and prowess to serve most generic computing needs of email, word processing and browsing. The 10-inch widescreen VGA LED, Intel GMA 950 graphics driven screen is bright. And despite its humble size, the X110 provides a couple of hours of very comfortable, non-stop, strain-free viewing. Your fingers won’t trip over themselves on the 82-key keyboard in the confined space. The location of the PgUp/PgDn keys up on top with the function keys may be a problem until you get used to the placement. Audio output is irritatingly tinny and sharp. The indicator lights right up front for power, battery, caps lock and WiFi are convenient for an at-a-glance status check. Since the netbook is so light, its balance is a bit off kilter and it leans back towards the rear, especially on soft surfaces such as a bed. Battery life, at two-and-a-half hours, is disappointing. However, considering that the three-cell lithium ion battery also translates into a less weighty proposition, some may find it a worthwhile compromise. The 40W adapter is not bulky and comes with a really long cable. The general build quality of the X110 is good. A tapered front gives it a less boxy appearance. The all-white models with their high-gloss exterior look rather plasticky and unappealing (that’s subjective, of course). On the other hand, darker colours in a shiny finish, though seemingly more dandy, tend to become fingerprint magnets. Overall, the LG X110 offers good value for money. No kin of Walt Disney’s famous animated creation, this Mini Mouse is about an inch shorter than a standard computer mouse. But there’s nothing “mini" at all about the 41.1x69.7x97mm, 107g wireless pointing device. Crafted with graceful curves, four primary buttons, scrollwheel and a stylish, bright neon blue horseshoe edging along its base (that lights up briefly when you move the mouse after a long interval), this desktop rodent is a charming chap. Deploying Microsoft’s new proprietary BlueTrack technology, it utilizes the crowded 2.4GHz radio frequency and works effortlessly from a distance of over 8m— whether it’s in line of sight of the accompanying USB transceiver dongle or not. When not in use, the dongle snaps into the base of the mouse for storage convenience and handy portability. Termed a “four-wheel drive" for mice, BlueTrack technology, quite like an all-terrain vehicle, allows you to use the Mini Mouse on as many as 40 different surfaces. We tried it on wood, glass, granite, carpets, high-sheen plastic as well as rough surfaces without any glitch at all. Sadly, its palm-sculpted curves are best suited only for right-handed users, not south paws. The single AA cell that sits inside the mouse body is rated to last four months. Its superb tracking abilities on virtually any surface—far surpassing most optical and laser mice—and elegant looks deserve full marks. Regrettably, its exalted price doesn’t.